Montessori classrooms operate on the principle of responsible freedom within limits. For our infant programs, this translates to teachers building trust with the children so they feel comfortable and confident observing and moving in their environment at their own pace. Montessori teachers seek to guide and assist, rather than direct the children, and education is conducted by the adults through modeling behavior and activities, so children learn by example as they absorb visual, auditory, and tactile cues. For the first six months of an infant’s life, they are observers of their environment more than active participants. For that reason, the environment is crucial to their development towards thought-driven vocalizations and body movements. 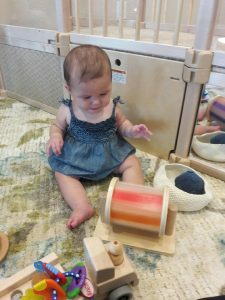 We provide a cozy and safe home-like environment that is specifically prepared for children both non-mobile and those just beginning to explore through sitting up, rolling, crawling, and grasping objects. The classroom has carefully chosen materials, many of which are self-directed and self-correcting, in order to foster the child’s sense of confidence and self-esteem, as well as trust in and respect for the environment. 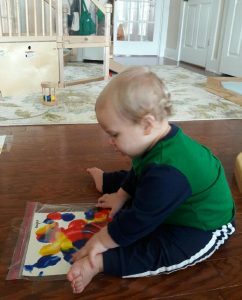 Materials are sized and placed for the child’s needs, not the adult caregiver’s, and are designed to provide the child freedom within limits and encourage self-driven movement. As an example of this, children are not restricted to cribs, high chairs, or other infant equipment. 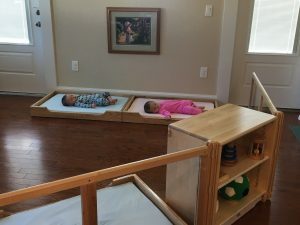 The sleeping area has low cots rather than cribs, so a child might roll or crawl on and off as they choose whether to sleep or explore. Tables and chairs for those children able to sit up are sized and shaped to assist them in their independence. Children’s individual eating and sleeping patterns will be noted and honored. Language and music are also important considerations in the Montessori classroom. Teachers speak to the children in normal speaking voices and read books aloud, and children also have opportunities throughout the day to listen to music, silence, and each other. Language development is encouraged through these auditory experiences and their own vocalizations as they begin to think about communicating their needs and desires. The Montessori infant classrooms are prepared in such a way as to assist your child in becoming mobile and independent with a desire to learn and explore their world.